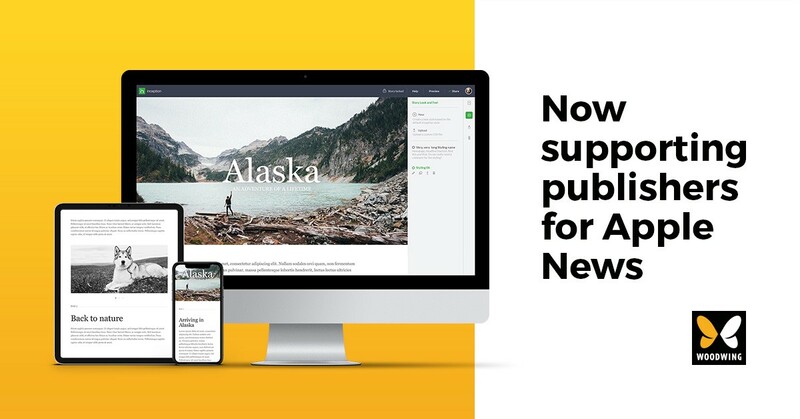 We are delighted to announce our solution for publishing to Apple News+, Apple’s subscription service for over 300 popular magazines, leading newspapers and digital publishers. This is an exciting opportunity for participating publishers in the US and Canada to reach new audiences in a beautiful, convenient and curated experience within the Apple News app. WoodWing makes publishing to Apple News+ simple by handling all the details. Our Digital Services Group styles publishers’ content in Apple News Format (ANF) using Inception, our cloud-based WYSIWYG digital editor. Creators will use the same software to review and revise content before publication. Once the publishing workflow is complete, we publish the content directly to Apple News+. Our combination of services and technology work hand-in-hand to deliver the best possible experience for both content creators and their audience. ANF is a proprietary JSON format used to create articles for Apple News+. An article created in this format can include text, images, audio, video, embedded social media, photo galleries, data tables, and interactive maps. It can be enhanced with animations, behaviors, and customized styles to create a unique look for a variety of content. Finished articles are processed and rendered in Apple News+. WoodWing Inception provides granular control over all of ANF’s formatting options, such as typeface, styling, layout, and other interactive elements. We also give creators the power to repurpose: publishing the same content to other channels, including in another app, Facebook Stories and WordPress without needing to reformat or restyle, saving time and resources. With ANF, you only have to author your content once. ANF automatically optimizes your articles for iPhone, iPad, and Mac, to give readers the best experience for their device. We look forward to helping more publishers deliver their quality content within Apple News+. To get started, contact us. WoodWing software helps brands, publishers, and agencies create content smoothly across teams and publish across channels. Customers include Hearst, Forbes, Axel Springer, Coca Cola, and Yamaha. To find out more, visit woodwing.com, or contact us. Insights and best practices for content creation, management, and publishing. Helping brands and publishers create content across channels and teams.